Green is one of the more popular choices for colored cabinet paint. 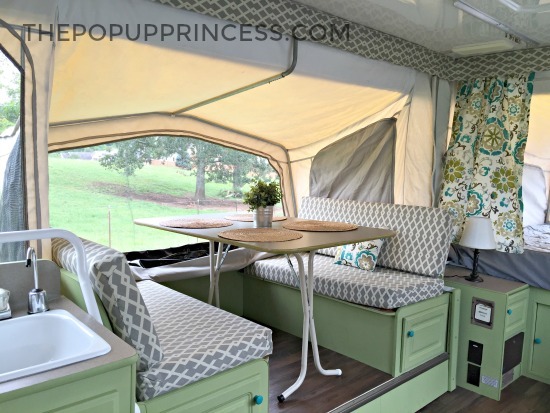 Felicia’s Pop Up Camper Makeover was the first remodel I featured with green cabinets. I just love the way Felicia chose a soft, pale green to coordinate with her curtain fabric. 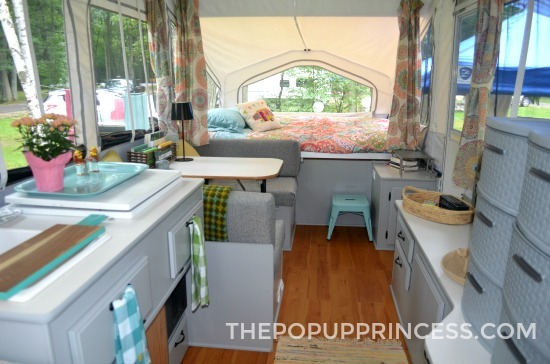 It gives her camper a serene, calming feel, which is exactly what Felicia was going for. It’s subtle, but green can also be a pretty bold choice, too. 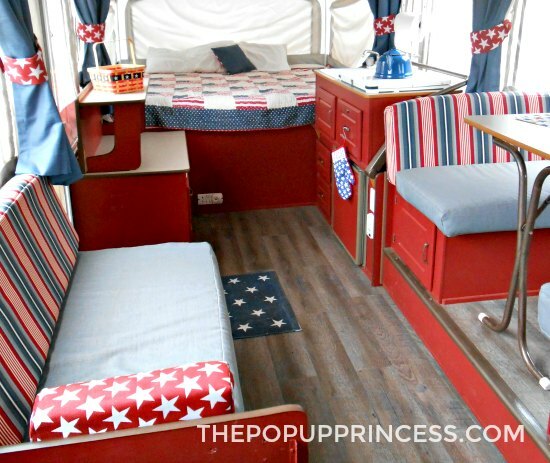 Take a look at Christie’s Pop Up Camper Makeover, for example. If that’s not bold, I don’t know what is! 😉 Christie was going for a bright, happy atmosphere when she was planning her camper remodel. Those green cabinets definitely helped accomplish that. It’s all about the shade of green and the coordinating fabrics. 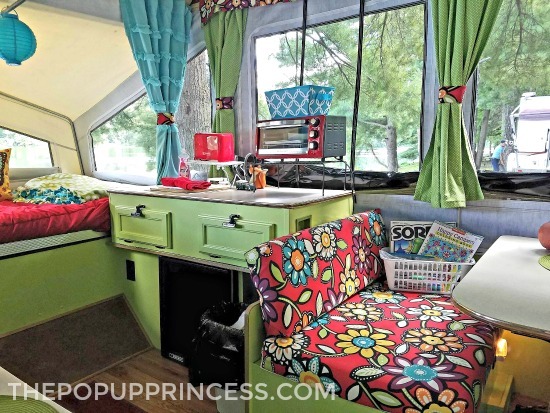 Christie’s bright floral print brings a fun feel to her camper, while Felicia’s choice of textiles softens that bold cabinet color choice. 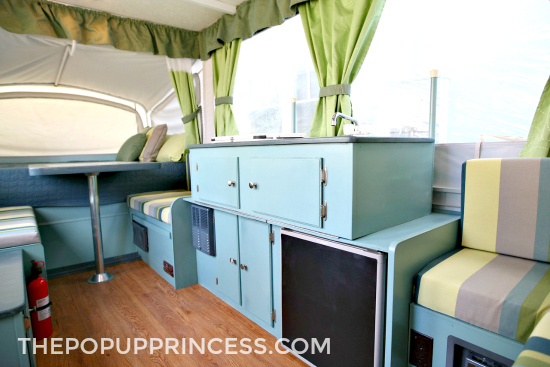 For more camper makeovers featuring green cabinets, make sure to check out these reader features. Readers like Heather, who selected a shade of turquoise blue to cover her cabinetry. She was afraid that white cabinetry wouldn’t hold up to the abuse of camping and kids, but honestly, those bold blues really make her remodel unique. Heather’s lovely blue cabinets combined with her whimsical fabrics give a bright and breezy look to the makeover. They make Heather’s Pop Up Camper Makeover so different than any of the campers I have featured here. But blue can be subtle, too. 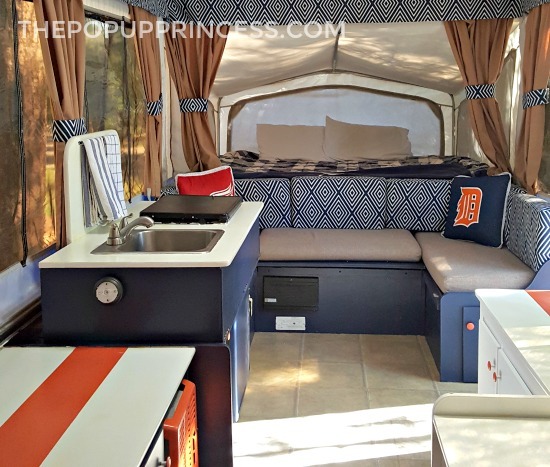 When Kelsa decided to give her Starcraft camper a Detroit-themed makeover, blue was a natural choice for the cabinet color. In contrast to Heather’s bright blue paint choice, Kelsa picked a deep navy. The navy adds a subtle pop of color without being overbearing. It allows Kelsa’s bold fabric choices to take center stage. You can read all about Kelsa’s makeover here, and if you’d like some more blue cabinet inspiration, check out these reader features. If blue and green are a little too bold for your taste, gray is a beautiful compromise. Amy Lynch opted to paint her Flagstaff cabinets a beautiful shade of gray. Gray is a really popular paint choice. The advantage to gray paint is that makes a great neutral base. 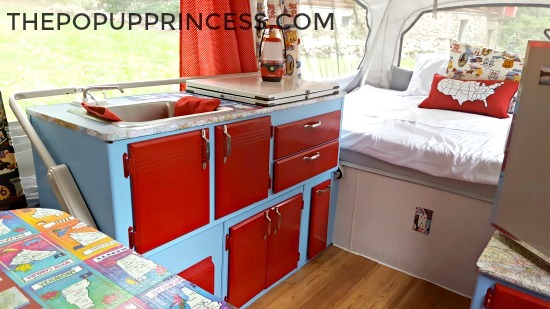 Amy can redecorate her camper easily without repainting the cabinets, as gray compliments so many other color palettes. Gray is also a great choice if you going for a more masculine look. Jennie and PJ went with a cabin theme for their pop up camper makeover. Dark gray was the perfect paint choice to compliment that theme. I love how clean and simple this makeover is. It appeals to everyone. You can find all our gray cabinet makeovers–including Jennie & PJ’s–here. The sky is really the limit on paint colors. 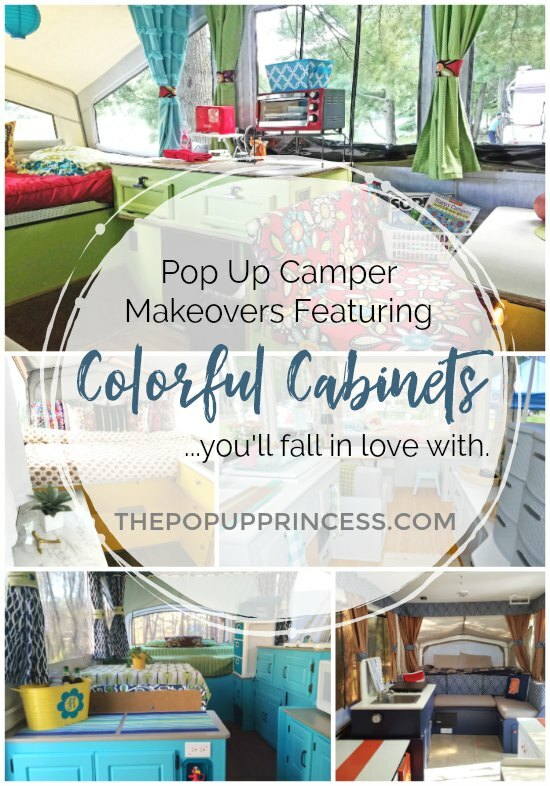 If you are looking for something that is a little more outside the box, you’ll want to make sure and check out Courtney’s Pop Up Camper Makeover. Courtney wanted her camper to have a Bohemian vibe, and she had always dreamed of having sunny yellow cabinets in her home. 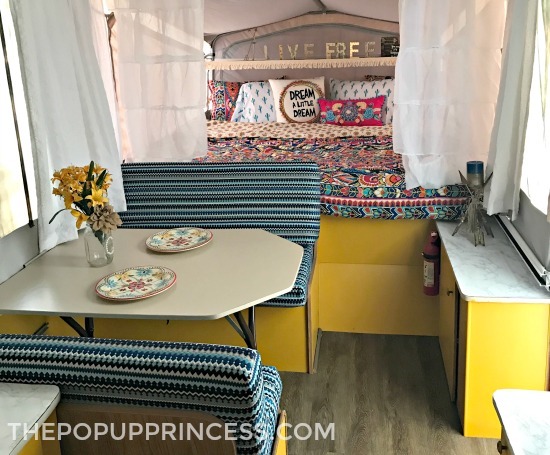 Because she wasn’t brave enough to go for yellow in her home, she thought her camper would be the perfect spot for this happy hue. And doesn’t it look amazing? You can be a little more daring when remodeling your camper than you can in your own home. Case in point? 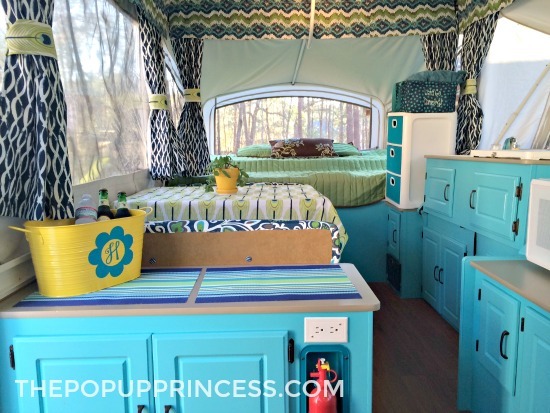 Melissa’s Pop Up Camper Makeover. Red cabinets are pretty daring, right? But in Melissa’s patriotic makeover, they work perfectly. Melissa used some great fabrics in her remodel, but the real attention-grabbers are those red cabinets. There are no boring neutrals here. If you love the idea of color, but aren’t quite brave enough to go as bold as Melissa did, you have options. Katie painted her cabinets white, but she still craved a little pop of color. She painted the interior of the drawers and doors a bright turquoise. It’s the best of both worlds, and opening those drawers would definitely put a smile on my face. 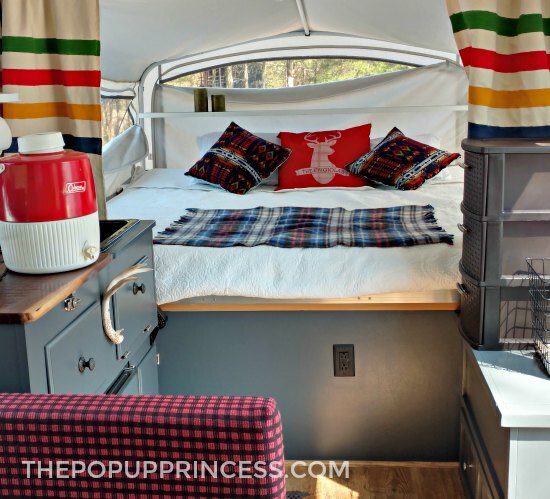 And, really, that’s what is important when remodeling your pop up camper–finding what makes you smile. I hope a few of these makeovers have inspired you with your own remodel. Whether it’s a bold blue, a graceful gray, or even neutral white, it’s all about what makes you happy. If you need a little more cabinet inspiration, be sure to check our Reader Features section. It is chock full of amazing remodels from our amazing readers. 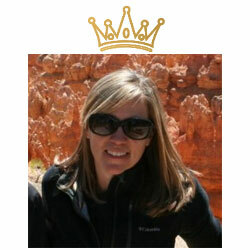 I abosolutely LOVE your blog. Such great inspiration! I also love your logo…do you happen to sell t-shirts with it? This is a great blog entry. 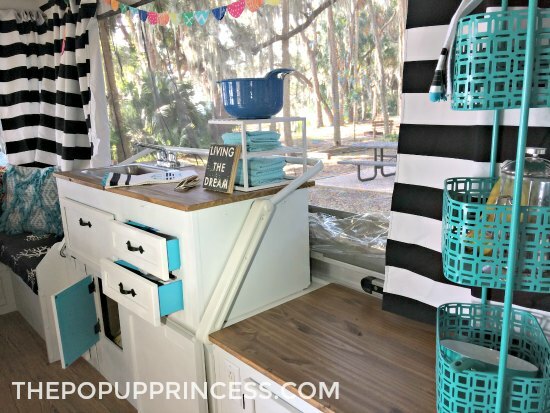 Thank you for totally throwing off my idea of painting my pop-up camper cabinets white! I was going to do white because my cabinets in my house are maple and I figured I may as well get my fresh white cabinets in the camper since I can’t have them at home. Well. Now I’m thinking differently. I may as well step outside of the box and add some fun to my camper. Because, well, campers should be fun. An escape. Literally! Thanks for all the fun links too! Now, as long as we don’t get another Nor’easter over here in Rhode Island maybe I’ll open her up and start painting! How well do the painted cabinets do in regards to scratching/chipping off? I’ve had poor luck with painted kitchen cabinets scratching, and I fear the camper would be similar. Is there any special prep or paint you use? Thanks!! I am getting my first pop up and can’t be more excited! It is an older model and in need of some sprucing up. What kind of paint do you recommend for the cabinets?